Chlorophyll is a green photosynthetic pigment found in plants, algae, and cyanobacteria. Chlorophyll is an essential component of photosynthesis, which helps plants get energy from light. Chlorophyll absorbs most strongly in the blue and to a lesser extent red portions of the electromagnetic spectrum. The green portions of the electromagnetic spectrum, including wavelengths between five hundred and approximately six hundred nanometers, are not absorbed well, but are reflected by the plants, hence the green color of chlorophyll-containing tissues like plant leaves. Chlorophyll, via its central role in photosynthesis, reflects harmony on both the sub-cellular and macro levels. On the sub-cellular level, the conversion of light energy via chlorphyll into useable chemical energy requies the complex coordination of several parts. On the higher level, the harmony between green plants, animals, and the environment is seen in the fact that plants use chlorophyll and water to convert carbon dioxide into glucose and free oxygen, while animals correspondingly use the oxygen and trapped energy stored in plant biomass and return carbon dioxide. Chlorophyll's name is derived from ancient Greek: chloros = green and phyllon = leaf. In plant photosynthesis, incoming light is absorbed by chlorophyll and other accessory pigments in the antenna complexes of photosystem I and photosystem II. The antenna pigments are predominantly chlorophyll a, chlorophyll b, absorbing violet-blue and red light, respectively, and carotenoids. Their absorption spectra are non-overlapping, which serves to broaden the specific bandwidths of light these individual compounds absorb during the process of photosynthesis. The carotenoids also play a role as antioxidants, and serve to reduce photo-oxidative damage to chlorophyll molecules. Each antenna complex has between 250 and 400 pigment molecules, and the energy they absorb is shuttled by resonance energy transfer to a specialized chlorophyll a at the reaction center of each photosystem. When either of the two chorophyll a molecules at the reaction center absorb energy, an electron is excited and transferred to an electron-acceptor molecule, leaving an electron hole in the donor chlorophyll. In a poorly-understood reaction, electrons from water molecules participate in an oxidation reaction, where the hole from the donor chlorophyll is filled (recombined with another electron), and diatomic oxygen (O2) is produced. Resulting chemical energy originating from the initial excited electron is eventually captured in the form of ATP and NADPH, and is then ultimately used to convert carbon dioxide (CO2) to carbohydrates. This CO2 fixation process results in the conversion (or an integrated external quantum efficiency) of 3 to 6 percent of the total incident solar radiation, with a theoretical maximum efficiency of 11 percent. In Photosystem II, the electron which reduces P680+ ultimately comes from the oxidation of water into O2 and H+ through several intermediates. This reaction is how photosynthetic organisms like plants produce O2 gas, and is the source for practically all the O2 in Earth's atmosphere. The photosystem reaction centers consist of a "special pair" of chlorophyll a molecules that are characterized by their specific absorption maximum. The special pair in photosystem I are designated P700, and those from photosystem II are designated P680. The P is short for pigment, and the number is the specific absorption peak in nanometers for the chlorophyll molecules in each reaction center. Chlorophyll a is common to all eukaryotic photosynthetic organisms, and, due to its central role in the reaction center, is essential for photosynthesis. The accessory pigments such as chlorophyll b and carotenoids are not essential. Some algae, such as brown algae and diatoms, use chlorophyll c as a substitute for chlorophyll b. Historically, red algae have been assumed to have chlorophyll d, although it could not be isolated from all species and even different collections of the same species. This puzzle has recently been resolved, since the chlorophyll d is actually from an epiphytic cyanobacterium (Acaryochloris marina) that lives on the red algae. These cyanobacteria have a ratio of chlorophyll d: chlorophyll a of approximately 30 to 1, and represent a rare example of a photosystem with chlorophyll d at the reaction center of the photosystem. All other known eukaryotes and cyanobacteria use chlorophyll a. There are likely to be many chlorophyll-d containing organisms awaiting discovery, for example a free living form was recently found in the Salton Sea (a salt lake in the United States). Other chemical variations of chlorophyll are found in photosynthetic bacteria, other than cyanobacteria (sometimes called blue-green algae). Purple bacteria use bacteriochlorophyll, which absorbs infrared light between 800 to 1000 nanometers, and the green sulphur bacteria use chlorobium chlorophyll. All known bacteria with bacteriochlorophyll have a form of photosynthesis that does not involve evolution of oxygen and so are called anoxyphotobacteria. 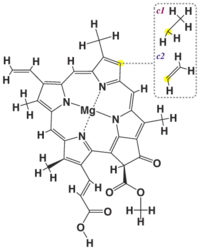 There is a very large number of different bacteriochlorophylls in different anoxyphotobacteria, including one species which contains zinc, rather than the usual magnesium as the coordinated metal. 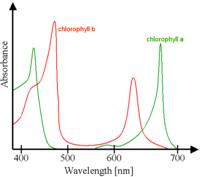 Because the different chlorophyll and non-chlorophyll pigments associated with the photosystems all have different spectra, the total absorption spectrum is broadened and flattened such that a wider range of red, orange, yellow, and blue light can be absorbed by plants and algae. 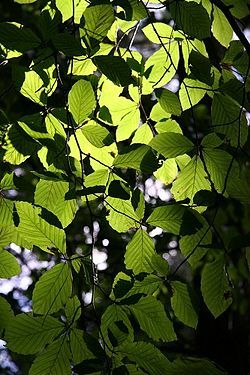 Most photosynthetic organisms do not have pigments which absorb green light well, thus most remaining light under leaf canopies in forests or under water with abundant plankton is green, a spectral effect called the "green window." Some organisms, such as cyanobacteria and red algae, contain accessory phycobilin pigments that can absorb green light relatively well and thus they can exploit the little remaining green light in these habitats. Chlorophyll can be shown to be vital for photosynthesis by destarching a leaf from a variegated plant and exposing it to light for several hours (variegated leaves have green areas that contain chlorophyll and white areas that have none). When tested with iodine solution, a color change revealing the presence of starch occurs only in regions of the leaf that were green and therefore contained chlorophyll. This shows that photosynthesis does not occur in areas where chlorophyll is absent, and constitutes evidence that the presence of chlorophyll is a requirement for photosynthesis. ↑ Food and Agriculture Organization of the United Nations. "Renewable biological systems for alternative sustainable energy production (FAO Agricultural Services Bulletin - 128)," chap. 1: Biological energy production. Retrieved July 25, 2007. Speer, Brian R. 1997. "Photosynthetic Pigments" in UCMP Glossary. University of California, Berkeley Museum of Paleontology. Retrieved July 25, 2007.